From what we hear, the springhouse used to have a second floor. When the second floor fell in, the springhouse was repaired minus the second floor. We often think about adding the second floor back. Inside the springhouse there are two rooms. The first room is full of water. 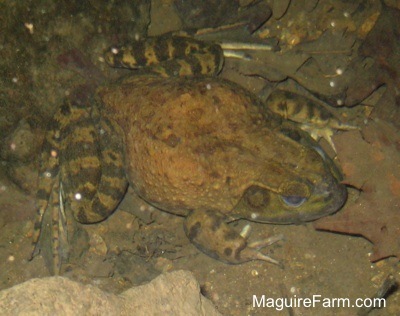 There are a few very large bullfrogs living in here. Amie adding more goldfish to the springhouse. There are already 4 large goldfish that have been living in there for about 3 years, and 5 more we had just added a few days before, which we had taken out of our tropical goldfish tank. They were feeder fish we had put into the tank to help the biofilter to get started. They served their purpose and are now retiring in the springhouse. Amie is adding 6 more feeder goldfish we bought from Petsmart. 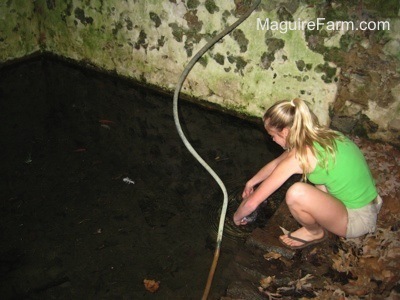 After floating the bag for about an hour, Amie mixes some springhouse water in to help the fish adjust to their new environment.